Cattle production in Laos is mainly based on the smallholder system with little or no management inputs. This means that cattle in these systems rely on natural feeds which occur in grazing and fallow land. Local and international support for improving smallholder livestock production, particularly through the introduction of enhanced feeding practices and animal health, has enabled farmers in the northern provinces to improve their practices. However, changes in smallholder production are limited and it has been found that the field staff who are working directly with farmers lack the required knowledge and experience in cattle nutrition and management. There is therefore a need to provide better knowledge to extension staff. 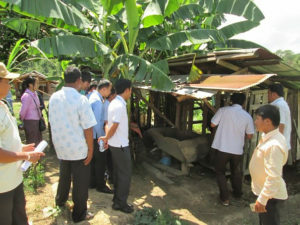 In response, the Crawford Fund supported a cattle nutrition, husbandry and biosecurity training course earlier this year in Xiengkhuang, Lao PDR. 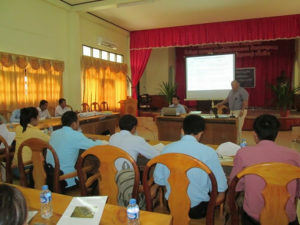 The course was attended by 19 extension officers and one livestock researcher from each of three provinces across Laos. The aim of the training was to provide knowledge on cattle nutrition, management practices (such as pen building and handling of animals) and animal health issues to provincial and district staff. Lecturers from the Livestock Research Center, Sydney University and the Department of Livestock and Fisheries were involved in providing course information on nutrition, husbandry and animal health. During the five days of training, participants were asked to identify the main constraints in existing cattle production in terms of nutrition and management, share their experiences on cattle health problems and treatments, and undertake a field exercise. These activities aimed to prompt discussions on the existing problems with current cattle production systems in local areas, identify practical ways to overcome the problems and learn how to handle livestock. Possible solutions, such as planting forages, providing high quality feed to cattle and vaccination as one method for preventing disease, were shared.